Students exploring the Shades Creek Watershed with staff of the Natural Lands Trust. BMX assembly about making good choices. Daredevil cyclist jumps over charter school staff. 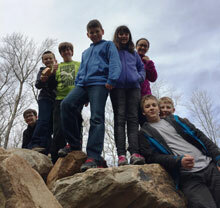 Rock climbing during Environmental Education Class. Enjoying a short story with Trooper Piekanski.